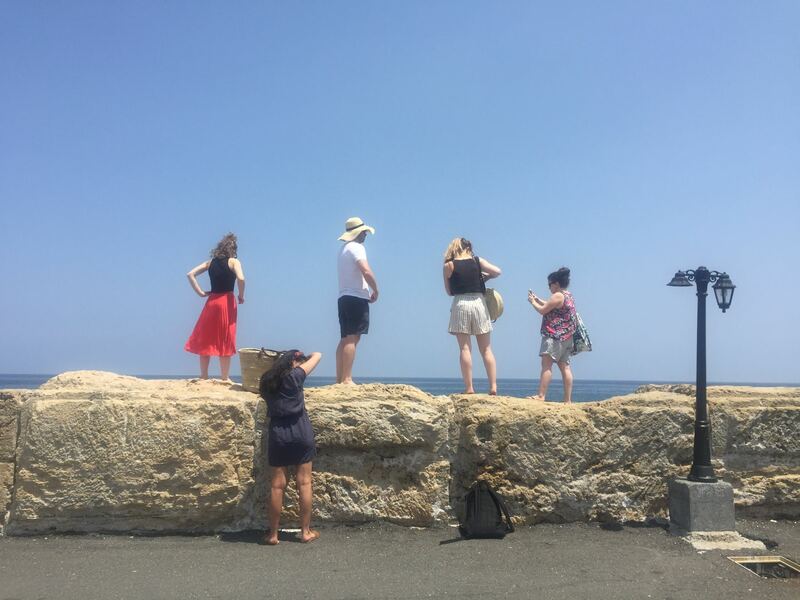 Our family holiday in North Cyprus was a week of lounging by the pool in the sun, exploring mountaintop castles, photographing beautiful ruins and eating lots of meat. 1. Sunbathe by the pool. 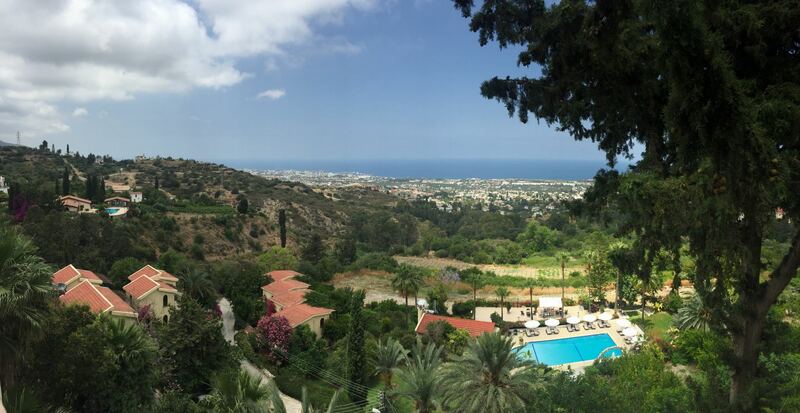 Wherever you’re staying in North Cyprus, you can’t possibly survive without a swimming pool! Temperatures in May range between 26 to 37 degrees, and peak just after lunch, so you’d better make sure you have an easy way of cooling down. We stayed at Villa Kibar where we were lucky to have a wonderful pool and lots of loungers and even a couple of hammocks. Bliss. Tom relaxing by the pool at Villa Kibar. The ruined monastery in Bellapais is a must-see. 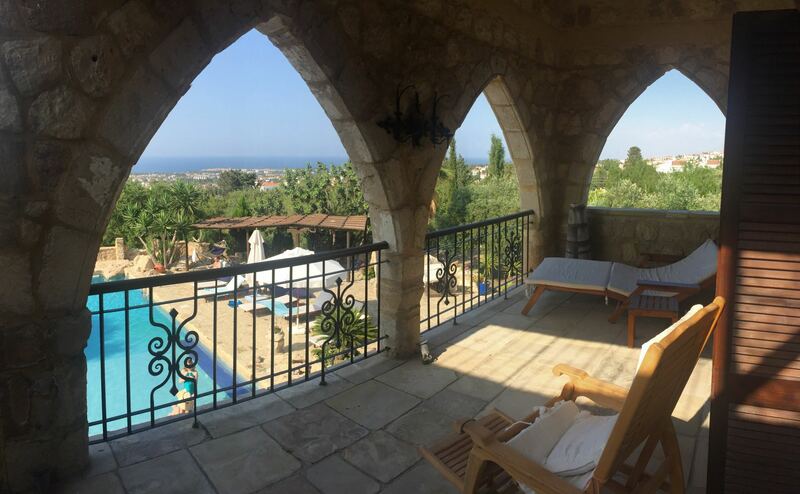 At 220m above sea level on the side of the Kyrenia mountains, it has a spectacular view over the surrounding villages and out to the Mediterranean. Bellapais itself is a small charming village with a few cafes, restaurants and boutiques, but the abbey is definitely the main attraction. The entrance to the abbey on Zafer Caddesi, Bellapais. Much of the main roof of the monastery has gone (although the chapel still operates as a concert venue and hosts the annual music festival), leaving the cloister and dormitories open to the sky. Left: The viewing point. Right: Looking down into the cloister from the upper platform. The view through the archways from the cloister. The beautiful stone archways around the cloister amazingly still stand, and are certainly one of the main draws for sightseers. 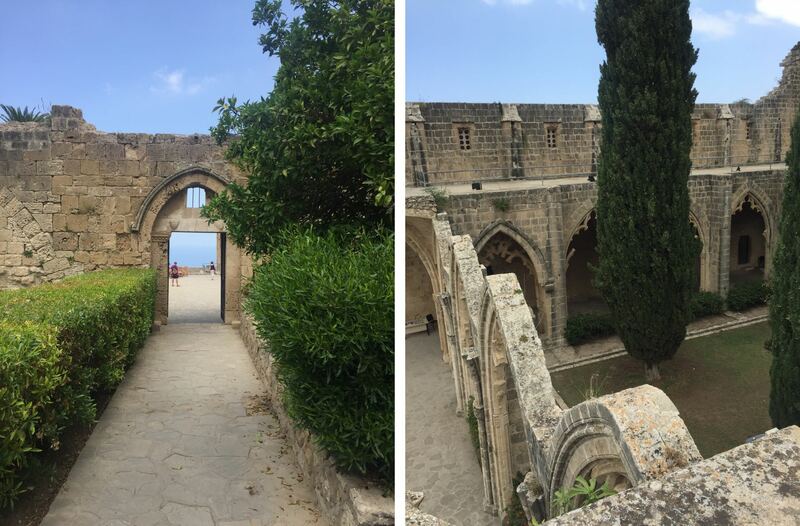 The cellars of the abbey have been repurposed as a photography exhibition hall for local Cypriot artists, and the rest of the monastery is regularly hired out as a wedding venue. Left: The intact areas of the cloister. Right: The ruins of the old dormitories. Walking tours are available from the ticket office so you can learn all about the abbey from a tour guide, or you can explore solo to really appreciate the serenity of the ruins. 3. Order a brandy sour. When we asked our villa host what local drinks we should try, she immediately recommended brand sours. A refreshing and fizzy combo of brandy, bitters, and lemonade or soda water, these cocktails are very easy to drink on a hot day, so watch yourself! Left: Brandy sours from Kybele, Bellapais. Right: Brandy sours from Veranda, Kyrenia. 4. Enjoy the view at Kybele Restaurant & Bar. 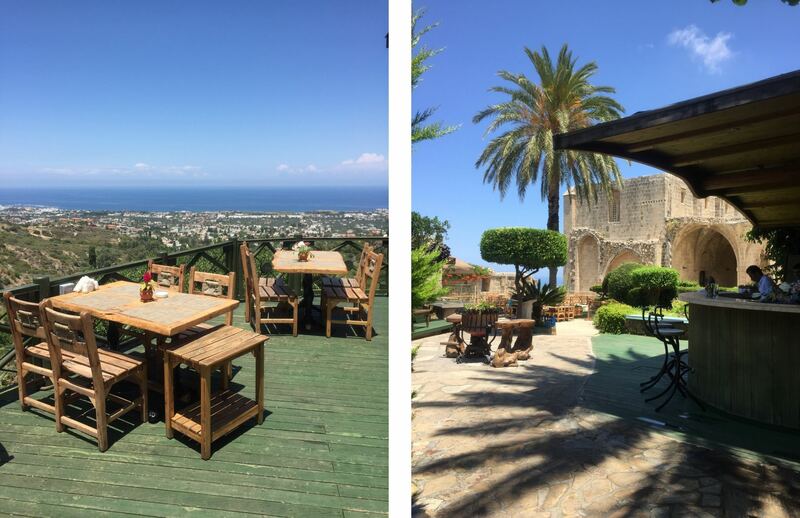 In the grounds of Bellapais Abbey you’ll find Kybele Restaurant & Bar, a sprawling dining spot that really makes the most of its 220m vantage point. Left: The view from the Kybele balcony. Right: Bellapais Abbey. Make sure you book to get the best spot, especially if you’re a large group or coming for drinks in the evening. The restaurant has all the local dishes as well as international cuisine, but the real highlight is definitely the view. Panoramic view to the sea from Kybele, Bellapais. 5. Find a turtle nest at Alagadi Beach. I’ll be honest, we weren’t bowled over by the beaches we found around Kyrenia. The area is very built up and geared towards Turkish holidaymakers who come to the island for one thing – gambling. This means most beaches have been commandeered and commercialised by gargantuan beach resort casinos. One of the only beaches left untouched is the sprawling untamed stretch of Alagadi, a protected area where turtles lay their eggs. Nearby is a conservation centre where students work to support the turtles and protect their eggs, so you don’t need to worry about disturbing the nests. Left: Hunting for turtles. 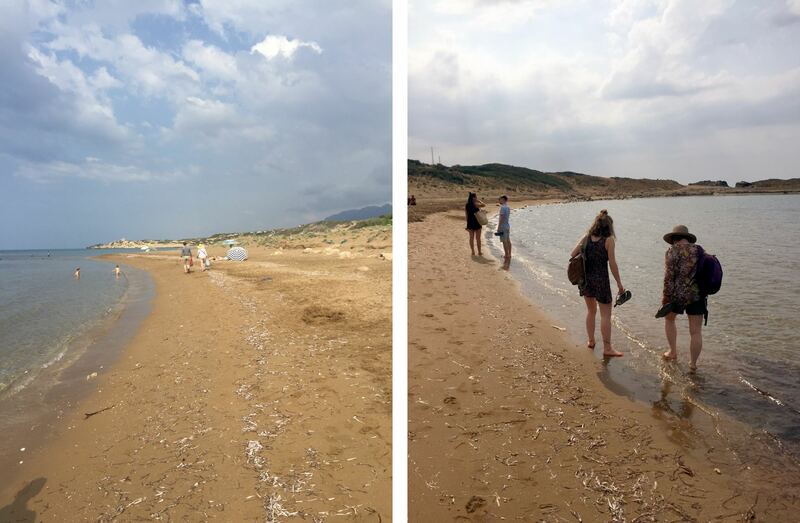 Right: Paddling in the warm Mediterranean sea. We spent a few hours here one afternoon on our trip, swimming in the extremely warm sea and drying off in the sun. There are no conveniences or places to buy drinks or food, so a few hours is the perfect amount of time before leaving to grab an ice cream at Mardo’s Cafe on the main strip. 6. Have a plate of mixed kebab. 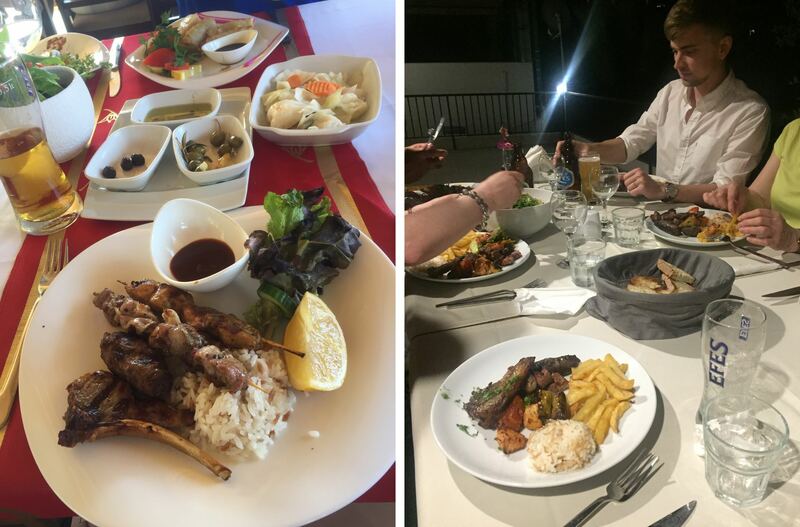 Can’t decide between chicken kebab, lamb chops, Turkish meatballs, or lamb kebab? You don’t have to! Taste a bit of everything with a plate of mixed kebab, available on most menus and usually served with rice and veg. Left: Mixed kebab from Kybele, Bellapais. Right: Mixed kebab from Five Fingers, Ozanköy. 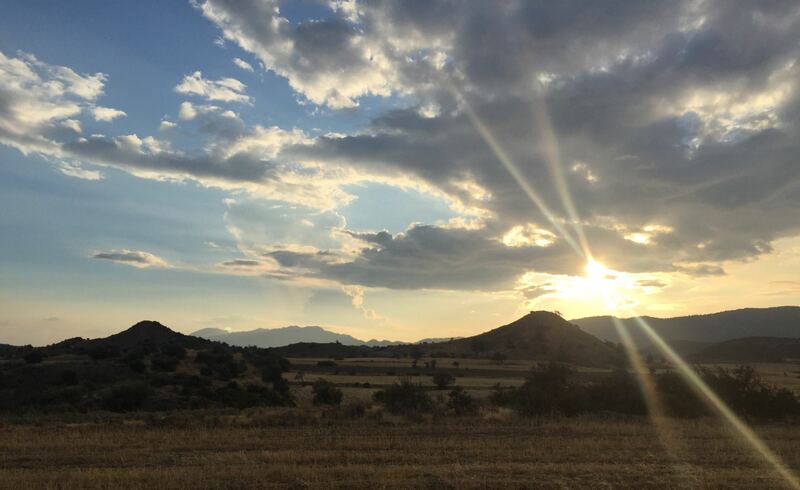 There’s something about Cyprus that gives you the most spectacular sunsets. As it hits the horizon over the sea the sun bursts into a red glow, reflecting on the clouds around it and casting purple shadows into the sky. 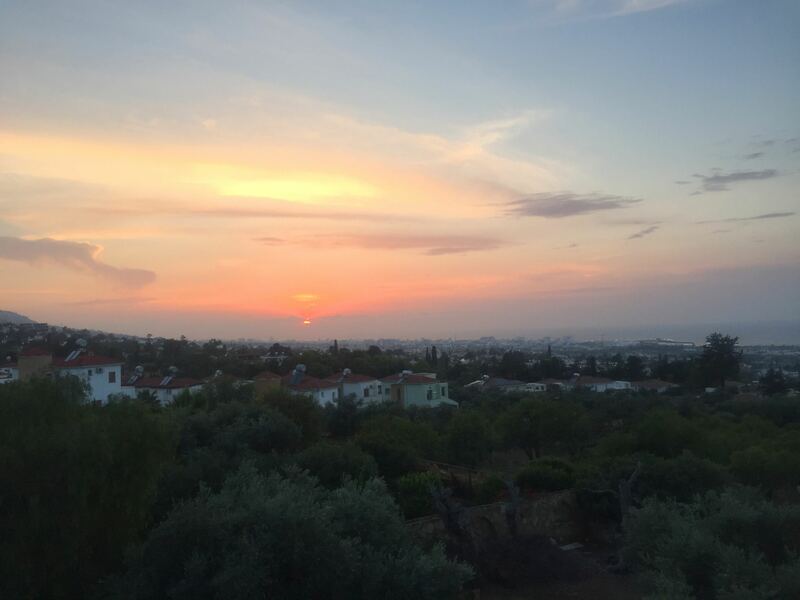 The sunset over Kyrenia, seen from the roof of our villa. 8. 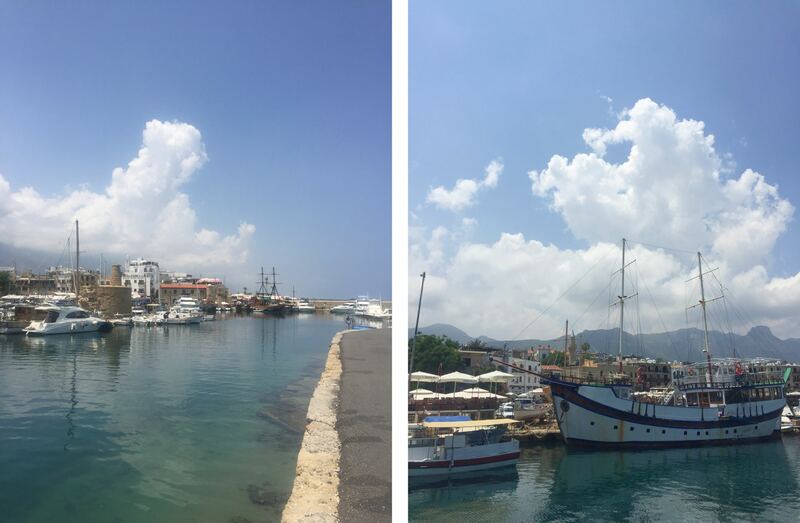 Walk around Kyrenia Harbour. 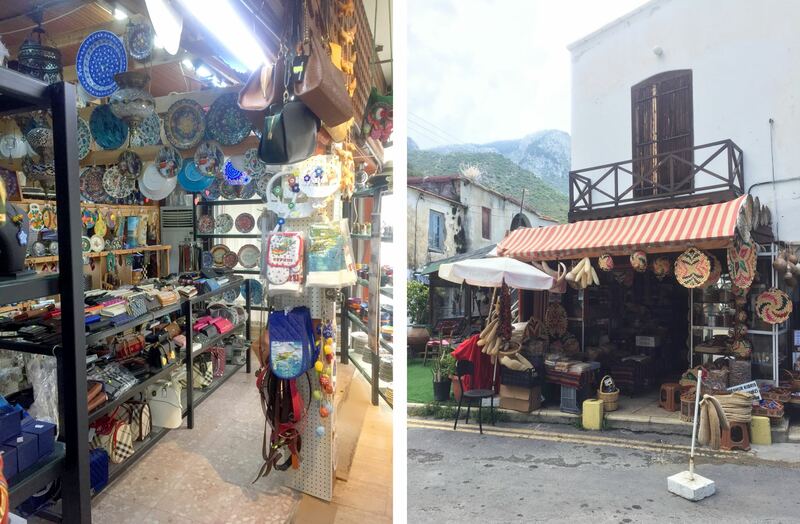 Kyrenia is said to have been founded in the 10th century BC! Historically the buildings around the harbour would have been Venetian homes and carob warehouses, and the architecture has been wisely preserved by the local businesses who have set up shop to make the most of rising tourism. Nowadays the harbour is full of restaurants and bars, and bristling with the masts of sailing boas and yachts. 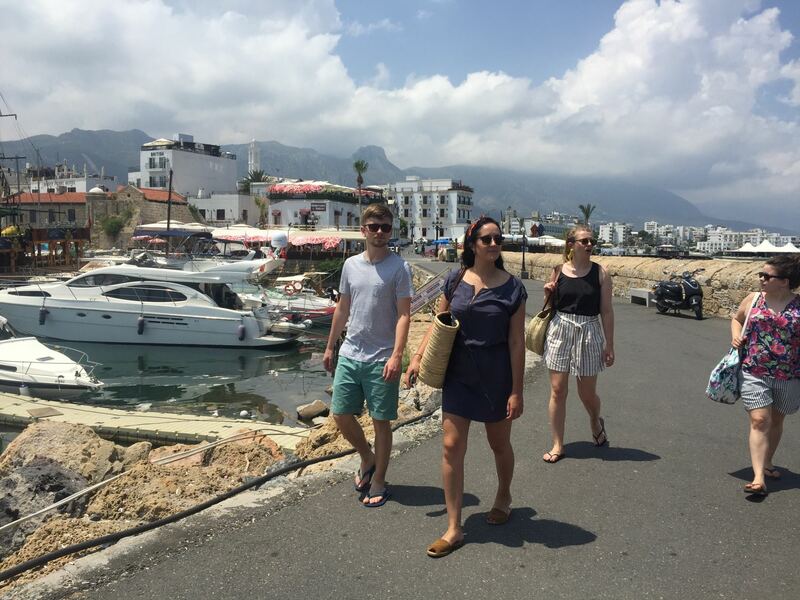 Walking around the old Venetian harbour in Kyrenia. Left: Looking back towards Kyrenia from the end of the harbour. Right: Some of the ships in port. Trying to spot sea turtles (and failing). 9. Refresh with some homemade lemonade. Most of the restaurants, cafes and bars in Cyprus serve homemade lemonade, with freshly squeezed lemon, shredded mint, lots of ice, and usually a fancy straw to top it off. It’s the perfect refreshing drink on a hot Mediterranean day. 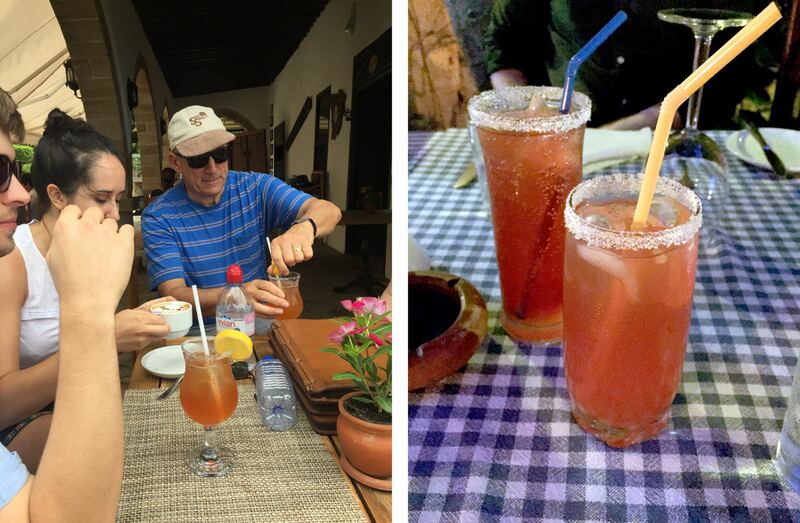 Left: Enjoying homemade lemonade at 6 Brothers, Kyrenia. Right: The view over the harbour. One of the best homemade lemonades we had was at the 6 Brothers Cafe Bar, on the corner of Kyrenia Harbour. The rooftop terrace gives amazing views of the sea and harbour too. 10. 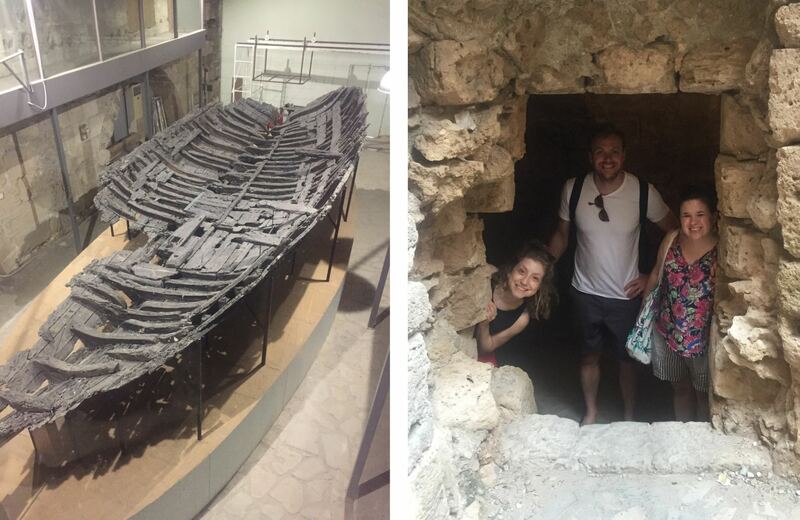 See the shipwreck museum at Kyrenia Castle. 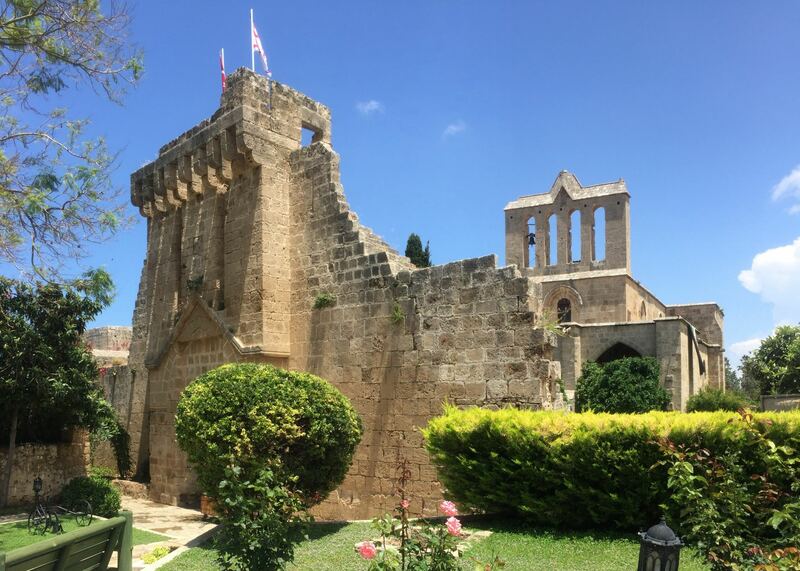 Excavations in Kyrenia Castle have suggested it could date as far back at the 7th century BC. It has Roman, Byzantine, Venetian, and Ottoman elements and was used by both British and Greek Cypriot armies for military purposes. It has four corner towers you can climb , an exhibition hall, a natural underground reservoir, dungeons, and a Byzantine church, as well as a museum on the neolithic village of Vrysi which was discovered near the city, and a shipwreck museum displaying he remains of an ancient ship and its cargo. Left: The oldest shipwreck in the world, from 300 BC. 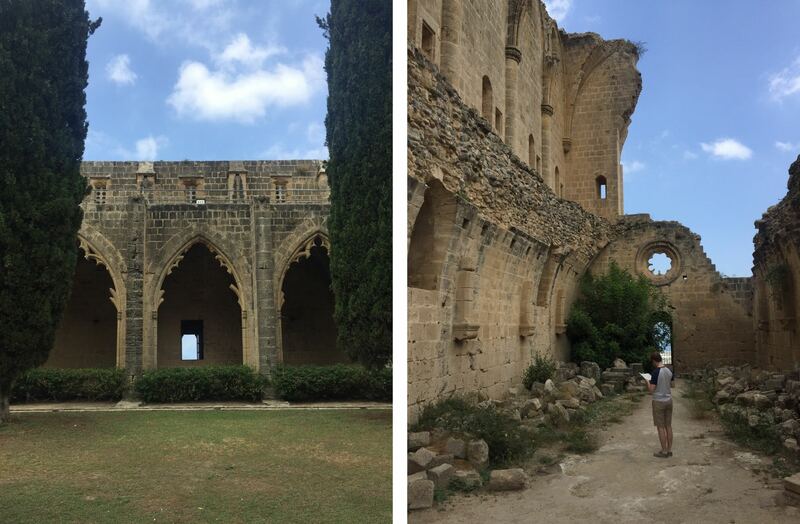 Right: Exploring Kyrenia Castle. Amazingly, the cargo of this ship include things like whole almonds still in their shells, olive stones, pottery, sailing equipment and amphorae of wine, which the ship would have been trading. They also found a note preserved on board with symbols inscribed, cursing the ship to sink! The view over Kyrenia Harbour from the Venetian tower. 11. Enjoy some traditional Turkish mezze. 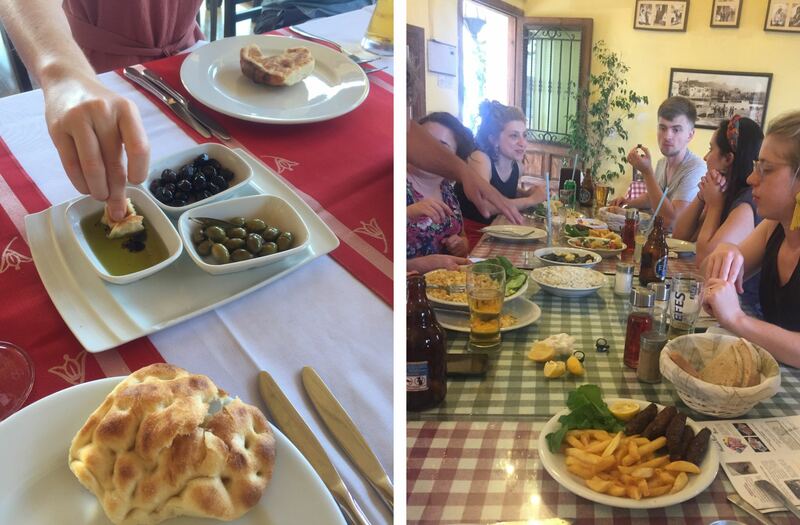 One of my main priorities on holidays is trying genuine traditional local foods, and it’s easy to do this in North Cyprus. The stars of the mezze show include the freshly baked breads, houmous, tzatziki, roast aubergine in tomato sauce, turkish meatballs, egg fried potatoes, stuffed vines, and grilled halloumi cheese. Left: Olives and flatbread from Kybele, Bellapais. Right: Mixed mezze from Kıbrıs Evi, Kyrenia. On your day in Kyrenia I really recommend you try all of these from the menu at Kıbrıs Evi, which is helpfully placed right at the entrance to the castle and has amazing views over the harbour. The view over Kyrenia Harbour from Kıbrıs Evi. 12. 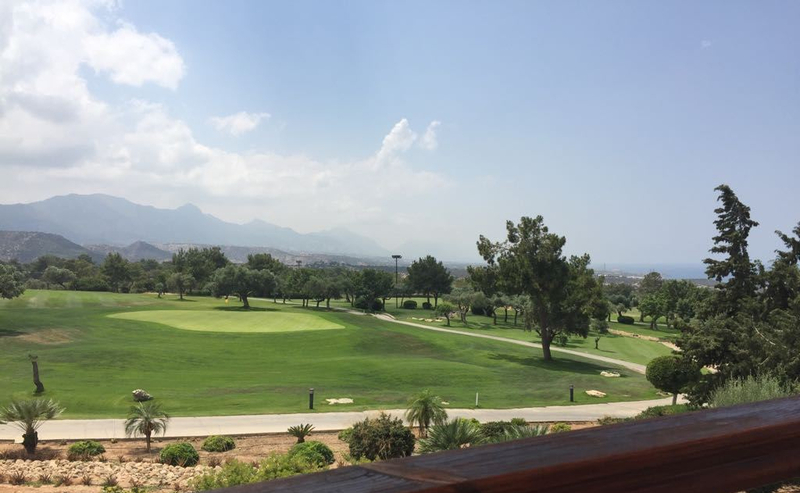 Play golf at Korineum Golf Resort. If the Whiteheads were to rank their holiday destination priorities, golf would be right at the top with nice weather. The dads golf without fail wherever they find themselves. 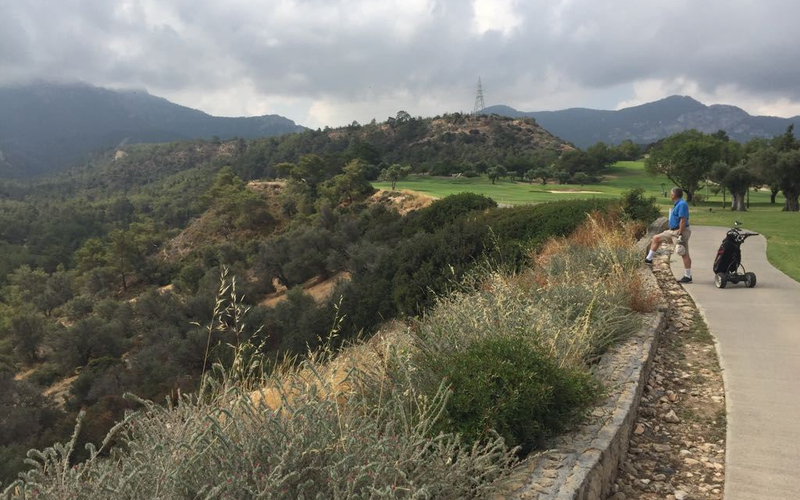 Luckily for them the choice really paid off this year – playing at Korineum Golf Resort near Kyrenia was one of their trip highlights. View over the course from the clubhouse. Uncle Ian surveying the first hole. 13. Grill some fresh fish from the Cypriot Sea. Another thing we asked our villa host was the best fish to eat. Being surrounded by water, Cyprus is a great place to enjoy fresh fish and seafood. It’s worth knowing what fish are seasonal too, she warned us off seabass as it would be farmed rather than fresh at that time of year, and instead recommended red mullet. 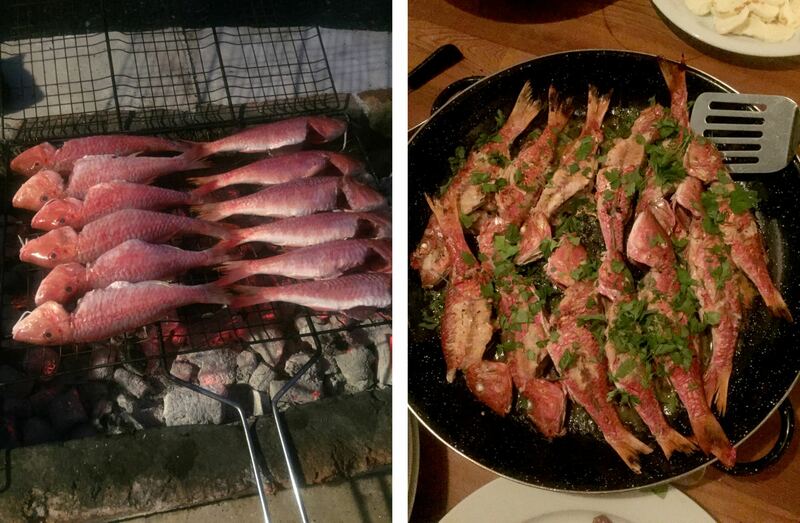 Left: Red mullet on the grill at Villa Kibar. Right: Serving up. 14. Rent a jeep and cross the Kyrenia mountains. You can’t get around Cyprus without a car. 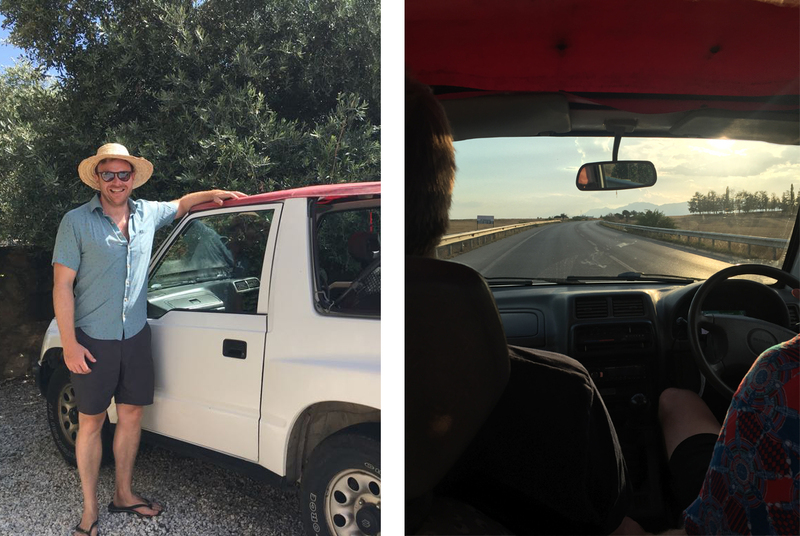 Our villa host arranged our car rentals for us through a local company that dropped three jeeps off at our villa. Left: Tom Colyer, designated driver. Right: Driving at sunset. The stunning landscape that can only be crossed by car. There’s nothing like driving over the Kyrenia mountains in an open top jeep and seeing the landscape spread out before you for miles around. There’s also nothing like being caught in a storm in a car that has no back windows. 15. Try some traditional Cypriot bread and baklava from Petek Patisserie. 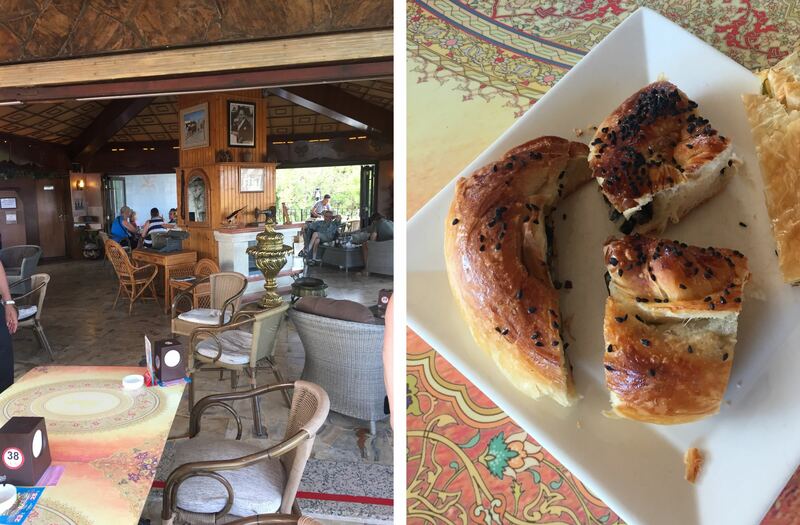 Petek Patisserie is a great place to eat on a day trip to Famagusta, with a welcoming interior and delicious fresh baked bread. Make sure you don’t leave without trying some of the gooey-est, sweetest baklava of your whole life. Left: The homely decor at Petek Patisserie. Right: Freshly baked olive stuffed bread. 16. 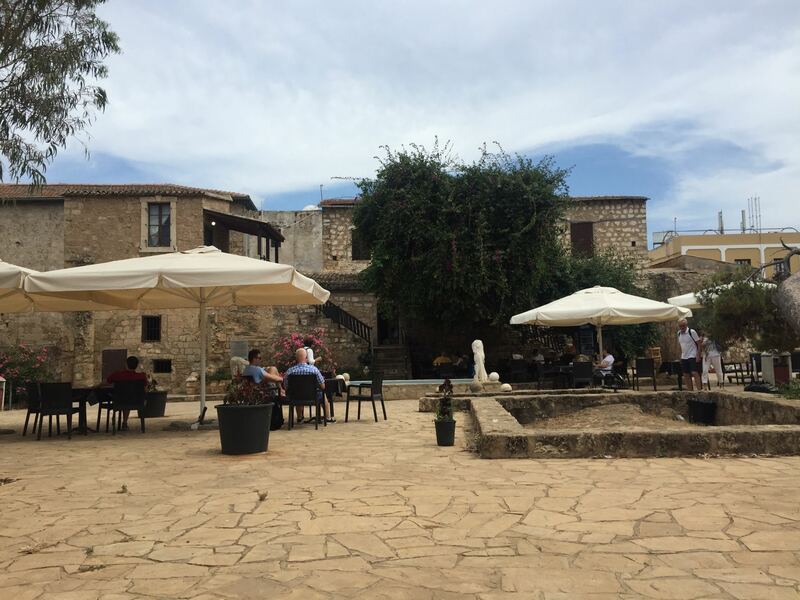 Walk the Venetian Walls around the old city of Famagusta. 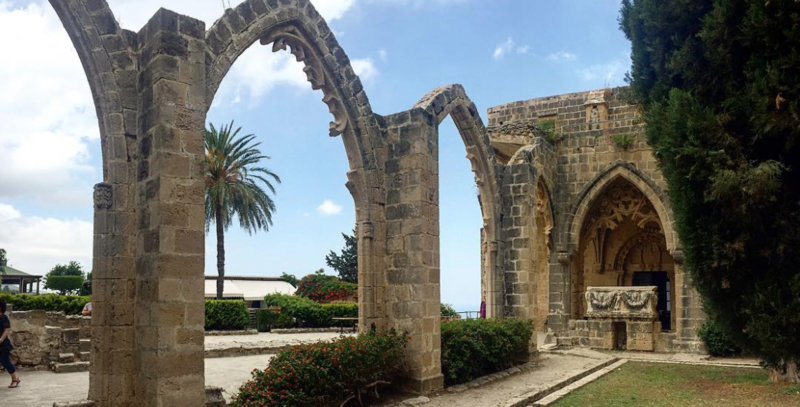 Famagusta (also known as Gazimağusa) is an old port town on the east coast, and was the key trading point of Medieval and Ottoman Cyprus. The old city is surrounded by Venetian Walls and jam packed with ruins. Matt and I on the Venetian Walls of Famagusta. Photo credit: Tom Whitehead. 17. Admire the Lala Mustafa Paşa Camii and Venetian Palace ruins. Those ruins I mentioned? The largest of them all, towering over the other buildings in the city, is the St Sophia Mosque. Originally St Nicholas Cathedral during Venetian rule, the towers and roof of the structure was badly damaged when the Ottomans invaded, and they turned it into a mosque without reconstructing, leaving this totally unique building. Once St Nicholas Cathedral, now Lala Mustafa Paşa Mosque. 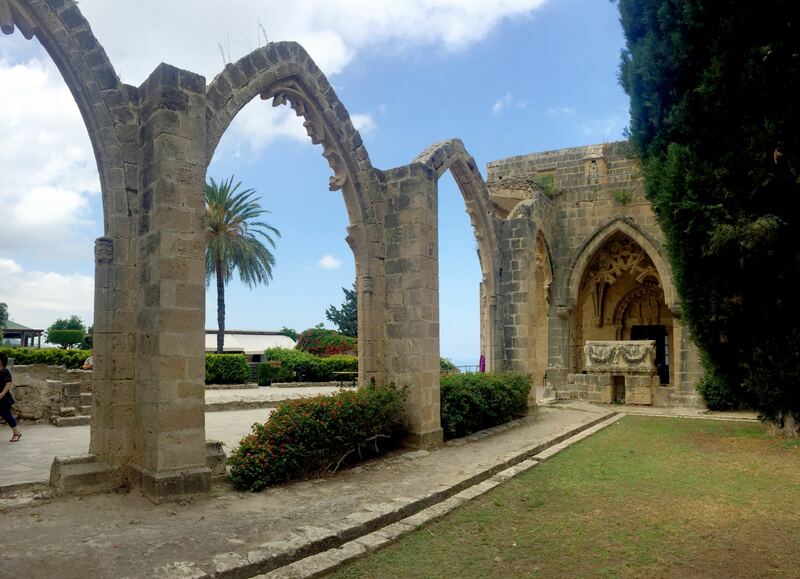 The Venetian Palazzo del Provveditore was built by the Lusignan Kings of Cyprus and later used as a governors palace. Only the grand facade and back courtyard remain. The ruins of the Venetian Palace, facing the mosque on Mahmut Celaleddin Sk. Another remaining area of the palace is the Namık Kemal Dungeon, which housed the revolutionary playwright Namık Kemal in the late 19th century. Namik Kemal Dungeon and Venetian Palace courtyard. 18. See the ghost town of Varosha from Palm Beach. 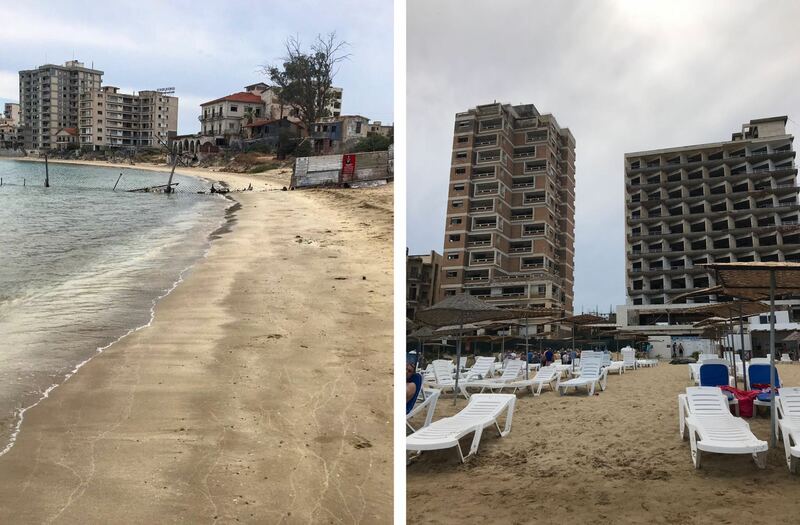 Athough it seems odd to be calling it a tourist attraction, you can’t go to Famagusta without seeing the ghost town of Varosha. Although the town itself is fenced off and tightly restricted by Turkish military, you can see the bombed out shells of hotels, left from the Turkish invasion of 1974, from Palm Beach. Read more about Varosha in my previous post. Left: The barrier fence goes all the way into the sea. Right: Deckchairs still line Palm Beach. 19. 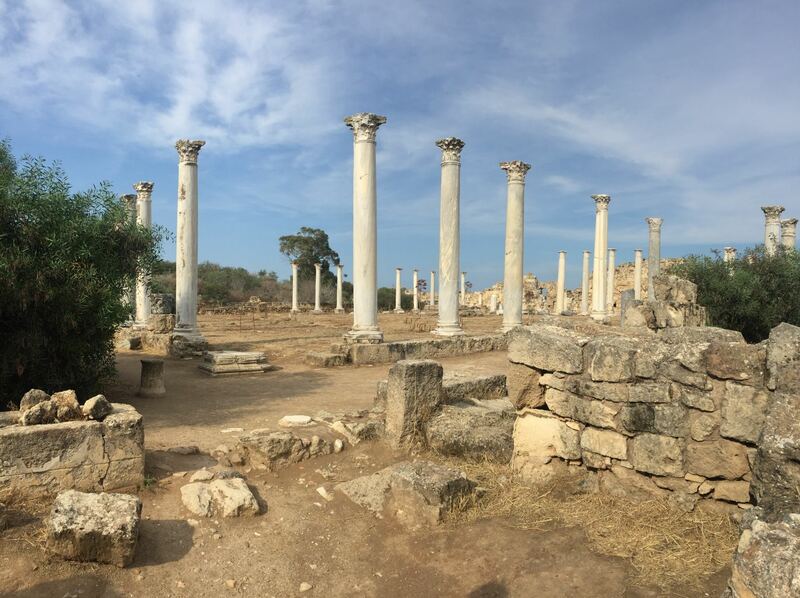 Explore the excavated Greco-Roman ruins at Salamis. 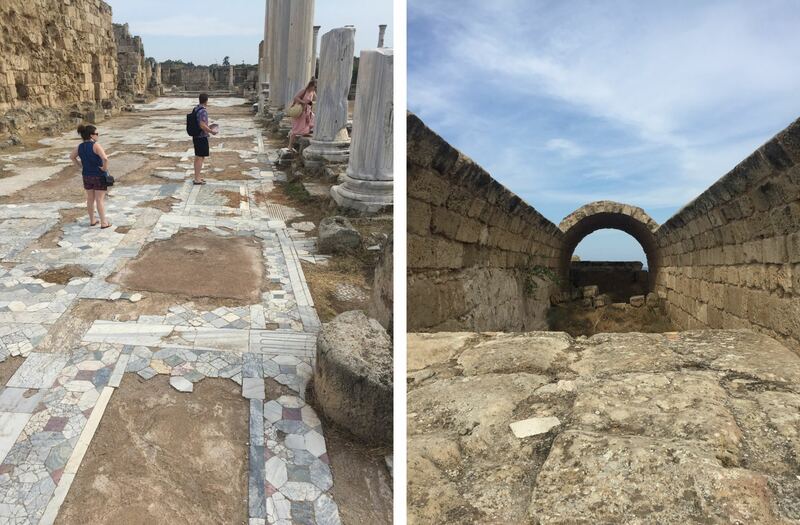 The excavations at Salamis reveal a long standing city that dates back as early as 1075 BC. Legend has it that it was founded by Teucer, who could not return home after the Trojan war because he had failed to avenge his brother Ajax. The Roman pillars around the Gymnasium and Baths. 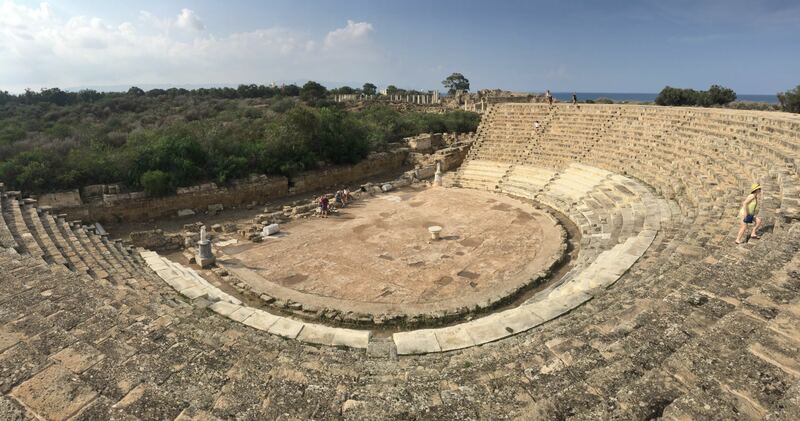 Located on the east coast just north of Famagusta (then called Arsinoe), Salamis was an important trading centre throughout ancient history, first under the Persian Empire, then Hellenistic, Roman, and Byzantine, before a series of natural disasters and pirate raids brought its end. Excavations on the site started in the 19th century and continued through to the 1970s, when they were interrupted by the Turkish invasion. Left: Remains of Byzantine tiles. Right: Remains of a Roman sauna. The site includes a massive gymnasium, surrounded by columns an used as an exercise ground, as well as swimming pools and baths with cold rooms and saunas. The other main feature is the amphitheatre, with 50 rows of seats that could have fit 15,000 audience members. The view from the top of the amphitheatre seats. There’s also a Roman villa, two basilicas, forum, temple and reservoir, although these are a considerable walk away from the main site and aren’t in as good a condition as the baths and theatre. 20. 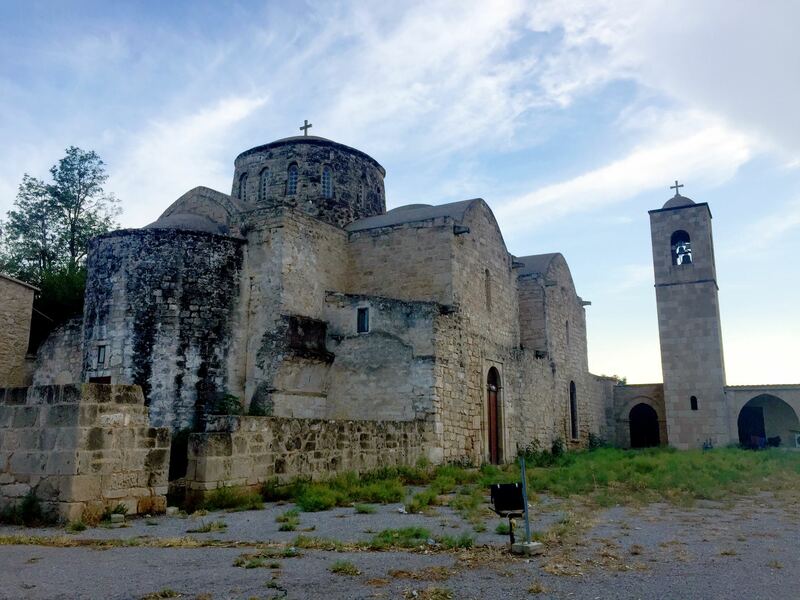 Go to Saint Barnabas Monastery and Archeological museum. All the artifacts excavated from Salamis are either in the British Museum or displayed in the Archaeological museum at St Barnabas Monastery, which in itself is a gorgeous 18th century church worth driving only 10 minutes up the road to see. St Barnabas Monastery at sunset. 21. Go on a snorkeling boat trip. 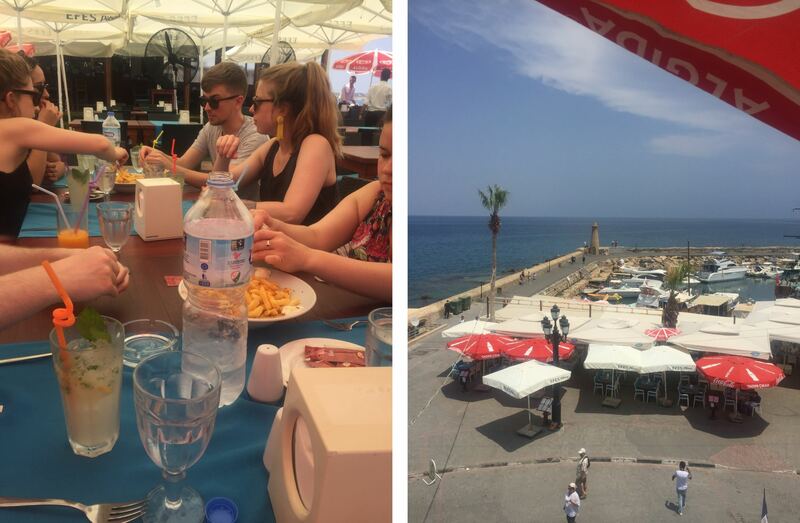 One of everyone’s favourite activities from our trip was the morning boat trip from Kyrenia. 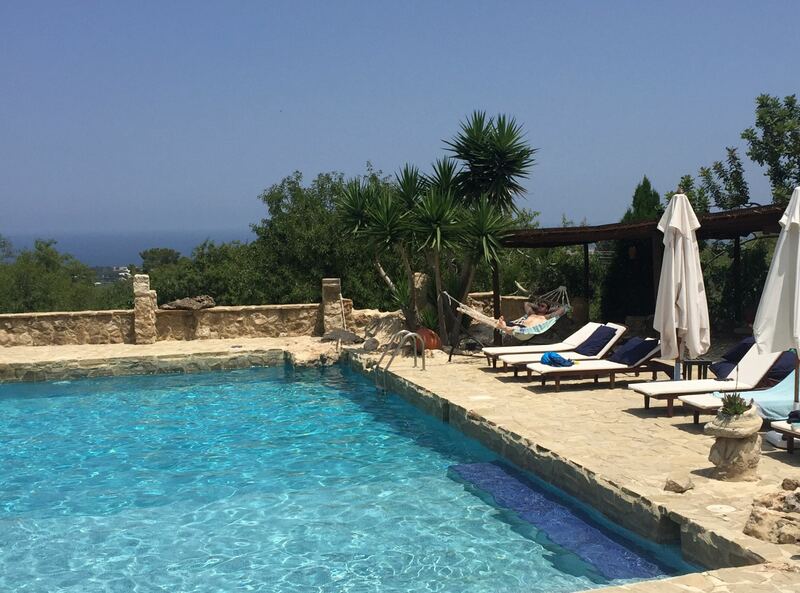 On a recommendation from our villa host (we have so much to thank her for), we used Scuba Cyprus, who took a group of us out and found the best spots for snorkeling and diving. 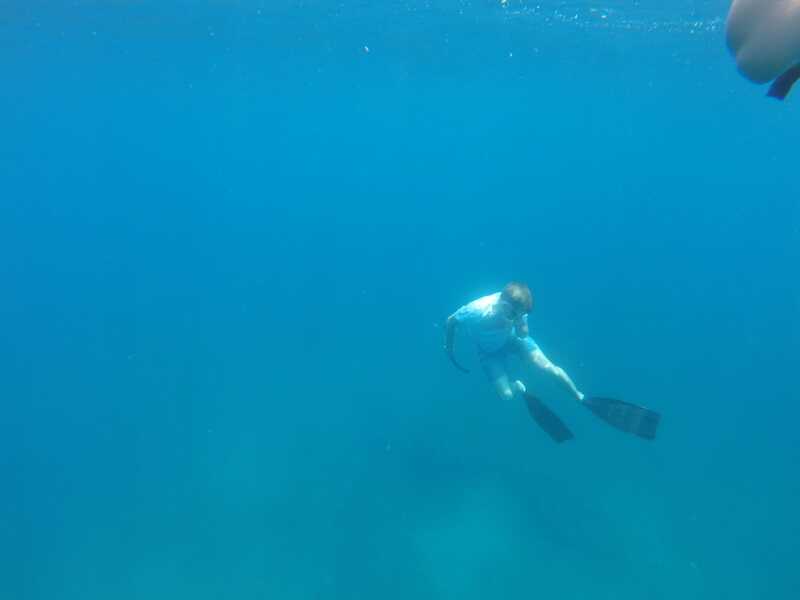 Tom Whitehead doing a spot of free diving. 22. Grab a doner kebab. Nothing makes you hungry like swimming! 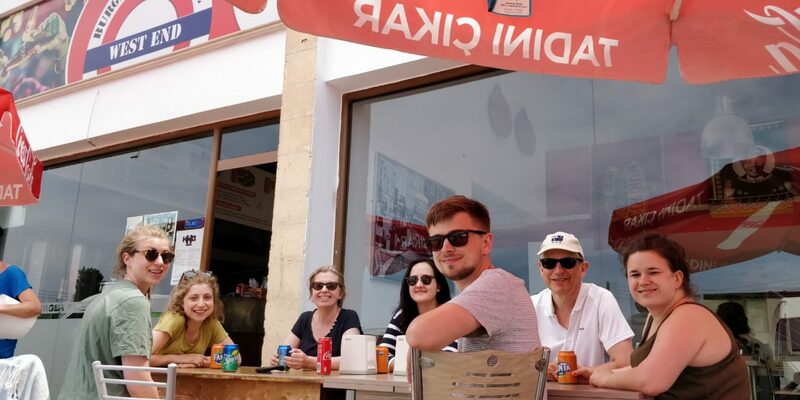 Our snorkelling group stopped at West End Burger & Kebab house and enjoyed some satisfyingly meaty kebabs. 23. 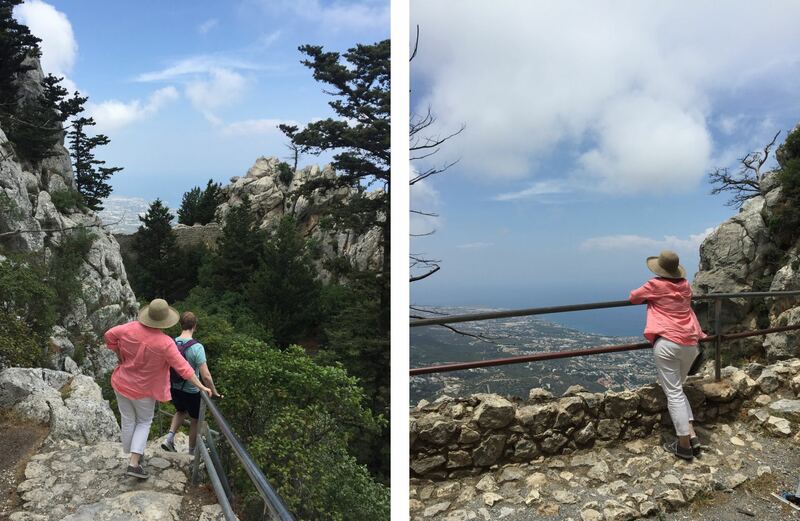 Take panoramic photos from St Hilarion Castle. Us non-snorkelers of the family went on a little drive to St Hilarion Castle, described in the flyers they handed us as “the main castle in Cyprus and one with the most impressive architecture”. 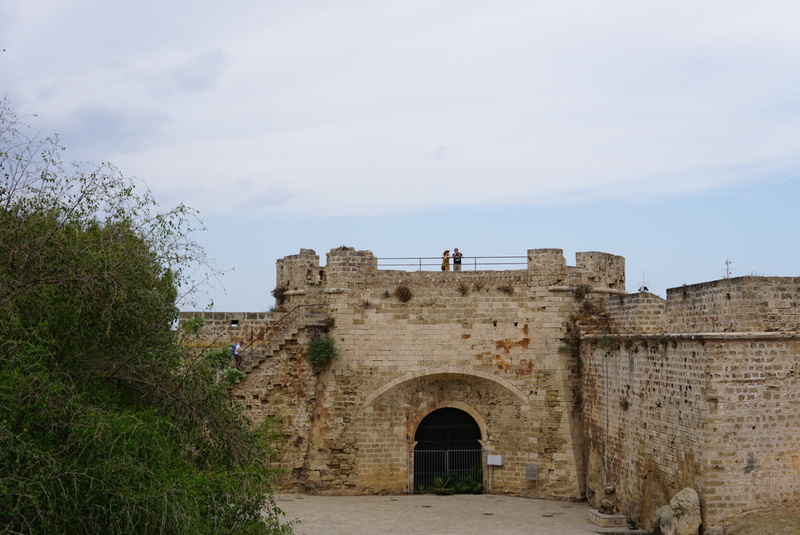 It was one of a series of castles built to protect the Cypriot public from attacks by sea, and is also mentioned in written accounts of King Richard’s invasion in 1191. 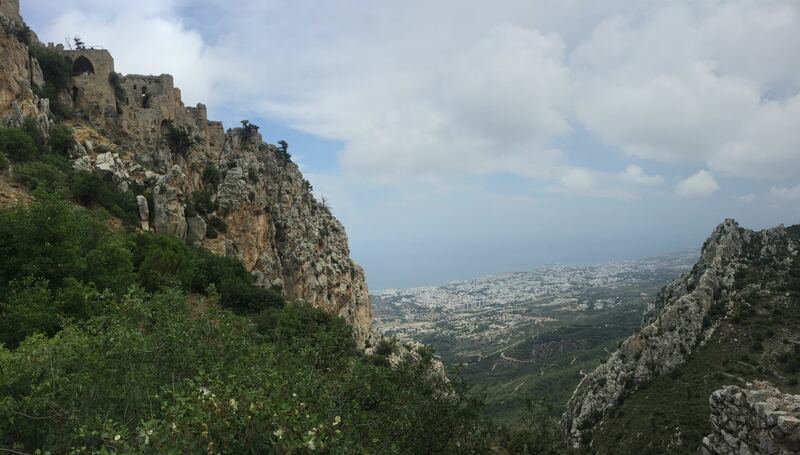 The view from St Hilarion over Kyrenia. The main legend of the castle seems to be of Prince John of Antiochbrother of King Peter I of Cyprus, who lived in the castle with his family to stay protected from the Genoese. He was manipulated by Queen Eleanor into believing that his soldiers were secretly plotting against him, so he called them one by one to the tallest tower and threw them to their deaths. Left: Mum and Matt climbing down from Prince John Tower. Right: Mum admiring the view from the Royal Apartments. 24. Enjoy a steak at the Veranda. Say it with me – we asked our villa host for restaurant recommendations, and her number one suggestion was The Veranda near Kyrenia. We were not disappointed. This charming little restaurant sits idyllically on the edge of the water, with leafy plants hanging overhead as you eat your meal by candlelight. 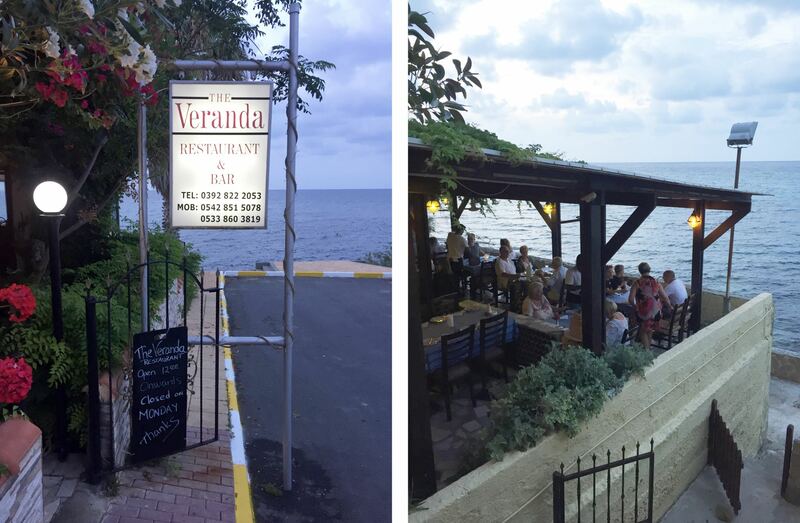 The Veranda Restaurant, Kyrenia, with its beautiful views of the Med. The catch of the day comes highly recommended, but if you like meat then you must order the rib eye steak, which was perfectly salted and mouthwateringly tender. 25. Take some of North Cyprus home with you. There are places to buy souvenirs everywhere of course, but we especially enjoyed the pottery on sale in Bellapais. Matt and I bought a little handpainted bowl, while my sister bought a big serving platter. Shops in Bellapais selling souvenirs. If we’d stayed any longer than a week I would definitely want to go to Nicosia. 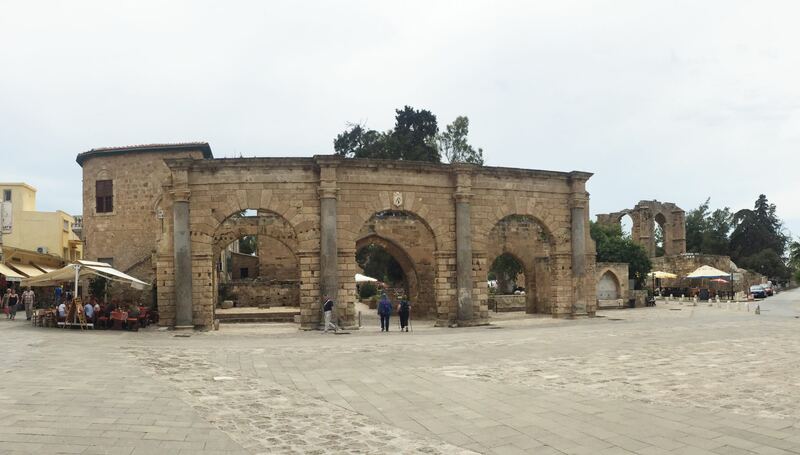 The capital city of Cyprus, Nicosia is split horizontally by the border and circled by old Venetian walls. In the north of the city you can visit the Büyük Han (a 16th century courtyard with boutique shops and cafes), Selimiye Camii (a 13th century gothic church, now mosque), and Belediye Pazarı (old market and bazaar). The south is more modern, with a few museums and galleries. 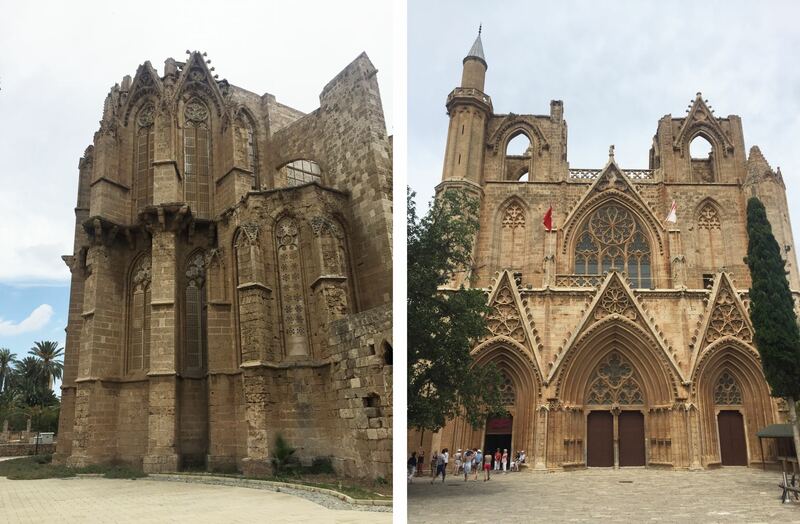 On my list to visit there was Faneromeni Church, the Archbishop’s Palace, Agios Ionannis Cathedral and Famagusta Gate. 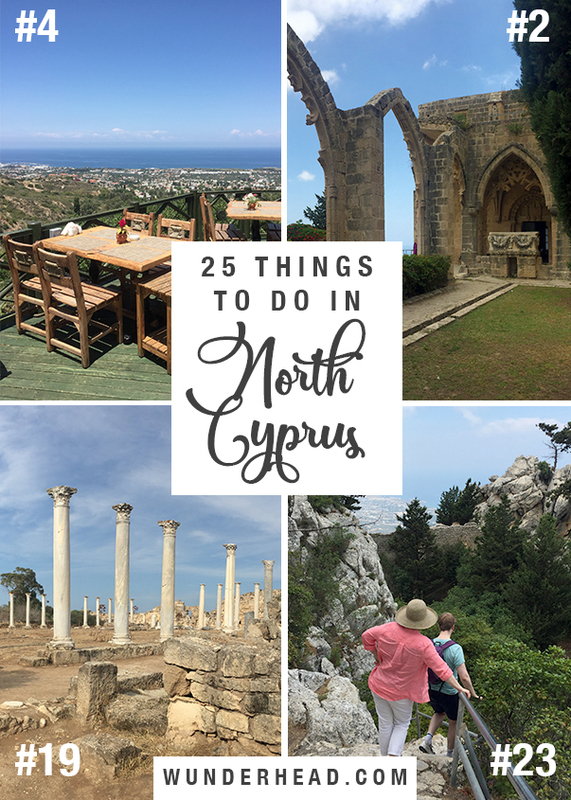 This was highly recommended by the Lonely Planet guide for North Cyprus. Situated between Hilarion Castle and Buffavento Castle, with a similar panoramic view of the surrounding country side and penisula, it was used to pass signals between the two. The castle has 101 rooms, and legend has it that once you’ve found the final one you will enter paradise. We thoroughly enjoyed our stay at Villa Kibar in Ozanköy, just a short walk from Bellapais and a short drive from Kyrenia. And as I’ve said again and again, our villa host had many useful tips and recommendations. The view from the master bedroom terrace at Villa Kibar. 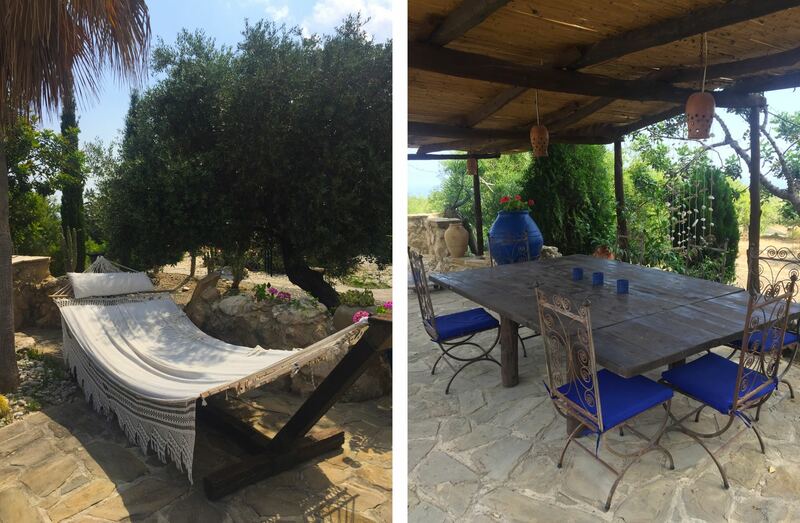 This large villa was perfect for our big family, with many bathrooms, a beautiful spacious kitchen and many outdoor seating areas to eat, sunbathe and relax as a group. Left: One of the many places to relax. Right: The outdoor dining and barbecue area. The roof was one of our favourite areas, especially at sunset, with total panoramic views over the surrounding villages, up to the Kyrenia mountains and out to the Mediterranean. 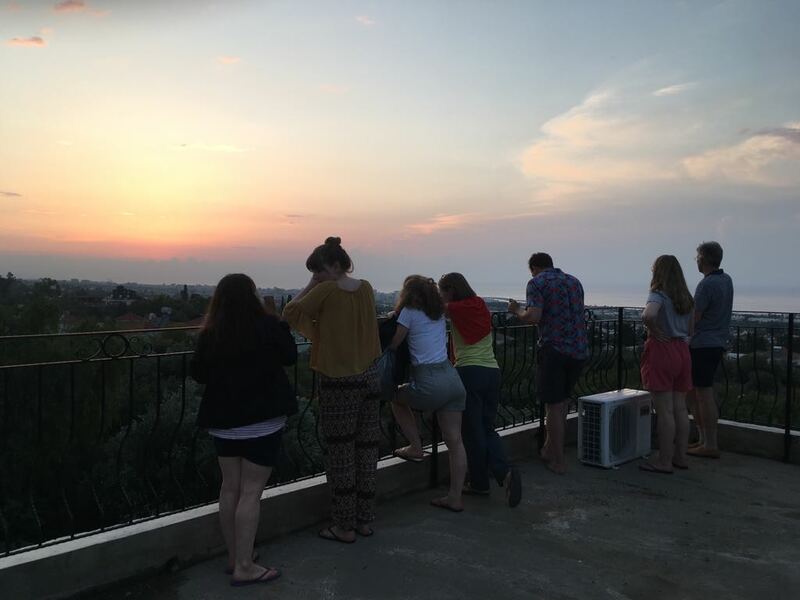 Watching the sunset from the roof of Villa Kibar. I’ll say it now, North Cyprus was not what we were expecting. The huge casinos and commercial beach resorts definitely had us worried when we first arrived, but after following the trusty recommendations from our villa host and some other tips from travel blogs, we ended up having a fab week exploring our corner of the island and learning about its fascinating history.